The in-shop press is a Chandler & Price 10x15 Platen Letterpress circa 1895 from Cleveland, Ohio. 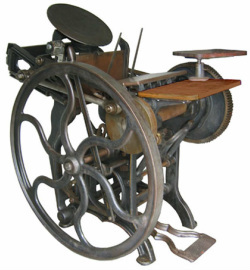 It is a fully functional press, and has been most recently used in the bookshop for printing broadsides and greeting cards. The first known information about this particular press comes from the 1940's, when it was utilized by Sitka High School's printing classes. In the 1950’s the press was used (and possibly owned) by the Alaska Lumber and Pulp Company to print their publication, The Pulpzette. The press has since had a variety of owners and printing purposes, including "The Sitka Shopper" in the 1970's. Old Harbor Books purchased the press in 1982, making it available for community use. *Letterpress printing is a style of relief printing using movable type in which a reversed and raised surface is inked and then pressed into a sheet of paper, resulting in a positive, right-reading image. Letterpress can also be the direct impression of inked printmaking blocks such as photo-etched zinc plates, linoleum blocks, and wood engravings. Here's a similar machine in operation.